Figure 1: A) Tip of a sharp sensor with to GMR sensors and an electrode deposited in a silicon substrate of 200µm. B) Planar sensor with three independent segments allowing a spatial-temporal recording. Magnetophysiology is the study of the magnetic fields generated by living organisms. In the case of ionic currents flowing into neurons or muscles, the generated magnetic signal is in the picotesla (10-12T) to nanotesla (10-9T) range, i.e. thousands to millions times smaller than the Earth field. SQUIDS are commonly used to sense these very weak magnetic fields , ; however, as they have to be kept at liquid helium temperature, they use at cellular level measurements can be complicated and impossible for microscale in vivo applications. In this project, the probes developed are called “Magnetrodes” as a magnetic equivalent of electrodes. They are based on spin electronics which offer the possibility to be miniaturized and sensitive enough (at room temperature) to detect the very weak magnetic signature of neural activity at cellular level . At CEA-Saclay, we develop two kinds of probes to record the magnetic signature at mesoscale and microscale for in vitro and in vivo experimentations. At microscale, sharp probes have been designed in a needle shape comparable to electrode design used for electrophysiology. These probes are used as deep sensors to perform localized magnetic recordings of the local neuronal activity. Sharps probes contain one or two GMR elements close to the tip of the probe, enabling gradiometric measurements. An electrode can be located next to the GMR sensors to have a local reference of the LFPs. They are fabricated on very thin Silicon substrate (from 100 to 200 µm) in order to be as less invasive as possible. 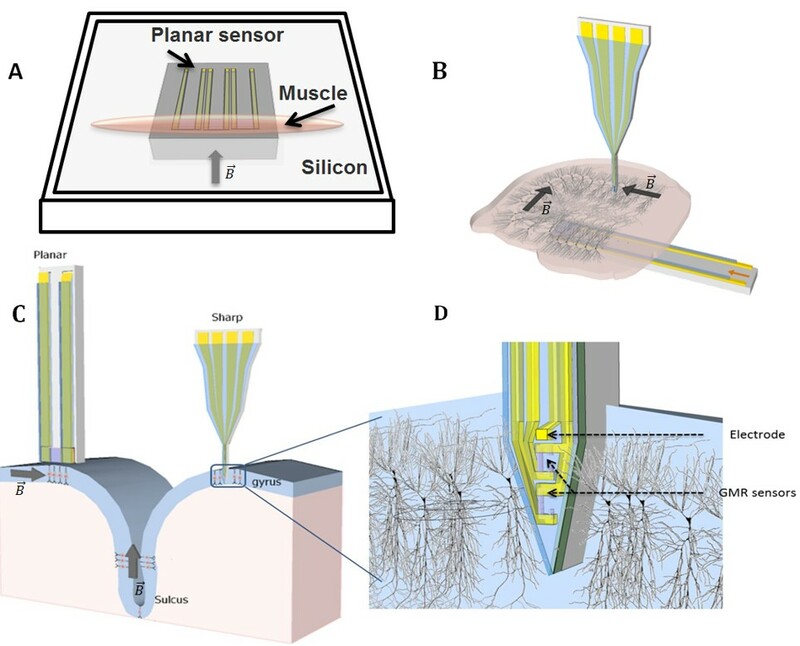 At mesoscale, planar probes are used to measure the magnetic field created at the surface of the muscular fibers or at the surface of the cerebral cortex. Planar probes contain a rather large GMR element deposited on a conventional 700µm-thick silicon substrate. Experimentations in vitro with the muscle ﬁbers of the mouse soleus, where the goal is to test the magnetrode technology with a relatively simple model of muscular action potential propagation. Experimentations in vitro with slices of brain hippocampus, where the neurons are parallel arranged and all the somata are lying on a same layer providing a summation of the magnetic ﬁeld. Experimentation in vivo on the visual cortex, where evoked neuronal responses are induced by direct visual stimulus. Figure 2: A) planar sensor for the mouse soleus setup. B) Sharp and planar probes for the hippocampal slice measurement. C) Sharp and planar probes for the cat’s visual cortex experimentation. D) Local measurement of the magnetic signature of an assembly of neurons in the visual cortex. In vitro experimentations are realized at the UNIC-CNRS in Gif-sur-Yvette and the in vivo experimentations at the Ernst Strüngmann Institute in Frankfurt. These measurements will contribute to the validation of the microscale and mesoscale electromagnetic models, of a single neuron or an assembly of neurons, developed at CNRS and at the Aalto University in Helsinki. Other probes (large arrays, SOI…) are developed by INESC-MN in Lisbon. "Magnetrodes" is an FP7-FET (Future and Emerging Technologies) European project coordinated by the CEA-Saclay. Two PhD students and a Post-doc participate at CEA to this project. E. Tarte, P. Magnelind, A. Y. Tzalenchuk, A. Lõhmus, D. Ansell, M. . Blamire, Z. Ivanov, and R. Dyball, “High Tc SQUID systems for magnetophysiology,” Phys. C Supercond., vol. 368, no. 1–4, pp. 50–54, Mar. 2002. P. E. Magnelind, Z. Ivanov, A. Y. Tzalenchuk, E. J. Tarte, and A. Lohmus, “A high-T/sub c/ SQUID based magnetophysiology system,” IEEE Trans. Appiled Supercond., vol. 13, no. 2, pp. 368–370, Jun. 2003. Contact : Myriam Pannetier-Lecoeur (SPEC/LNO).